The Global Summit Experience Lab is where you learn cutting-edge technology, such as InterSystems IRIS Data Platform, by using it in an assigned challenge. Throughout the Summit, we will offer “experiences” focusing on the newest of our new technologies. Each experience will start with a brief introduction, outlining a particular task. Then you will be set free to complete the task, using one or more of our new technologies as you do so. Each experience should take about 45 minutes to complete. Sales engineers and other experts will be on hand to offer advice and assistance. The Experience Lab is located in the Tech Exchange (Grand Oaks Ballroom K,L, &M). Space in the Experience Lab is limited! Sign up in advance as part of the registration process for the Global Summit. Experiences will be repeated to allow flexibility in scheduling. 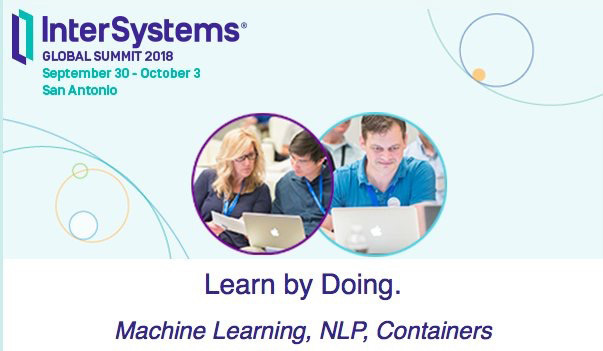 See you at InterSystems Global Summit 2018!